The recent interest in cigarette smoking among university students has brought attention to problems concerning opinions, attitudes, prevention, health education, policy formulation and implementation. This survey research tested five hypotheses on the views of college students about smoking in school hallways and cafeteria, compliance with anti smoking laws, considering cigarette smoking as an expression of freedom of choice, teachers’ smoking in lassrooms and in their offices, and school administration’s policy on enforcing the law. Hypothesized differences between students’ views on the issues according to gender, smoking status and years at school were investigated. Data were obtained from 3,659 students attending six universities in Ankara, Turkey. The study findings provided support for all the hypothesized differences (except a single issue). Males and females differed significantly on all the issues studied. The majority of nonsmoking students have anti-smoking views in regards of the studied issues as compared to regular and occasional smokers. Smokers and nonsmokers markedly disagree on banning cigarette smoking in the cafeteria and hallways. However, the majority of students are against teachers’ smoking in classrooms and in their offices with the doors open. 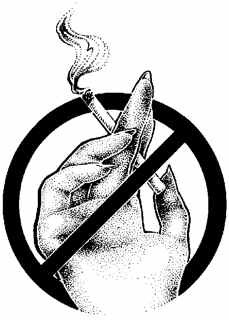 Although most students want a smoke free environment, there is no active-anti smoking policy on smoking by universities. Findings point out the need for campus-wide effective smoking prevention programs, as well as cessation programs and services for the students.